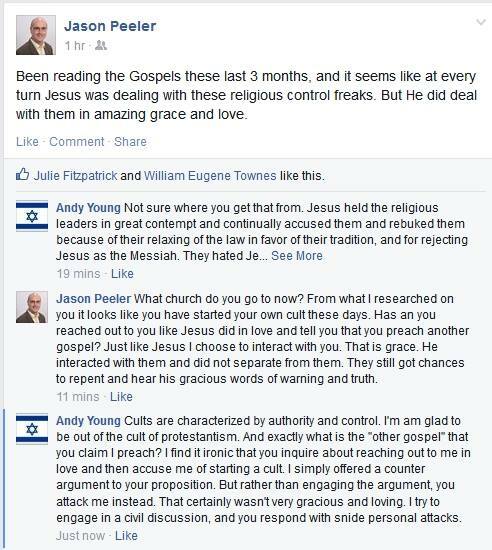 As I was reviewing this blast from the past I noticed that Mr. Peeler referred to the Jewish religious leaders as “control freaks”, yet he didn’t seem to have any problem in desiring control over me when I challenged him on his observation. 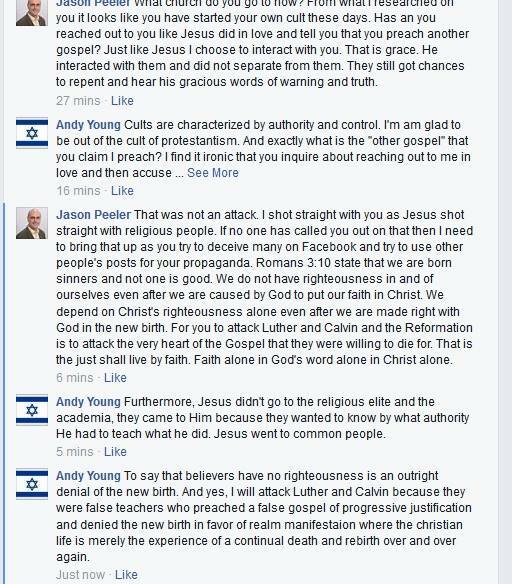 Notice in his comments how he equates being a “true believer” with things such as “church membership” and “being under authority.” Needless to say, Mr Peeler hasn’t had me on his Facebook friend list for quite some time now. I’m not losing any sleep over it, though. So when you are born into a family, you “place yourself” under the authority of your parents?? The analogy breaks down because a born again believer has a spiritual Father in God, “the Father ya know” and is co-heir with Christ in the Resurrection. 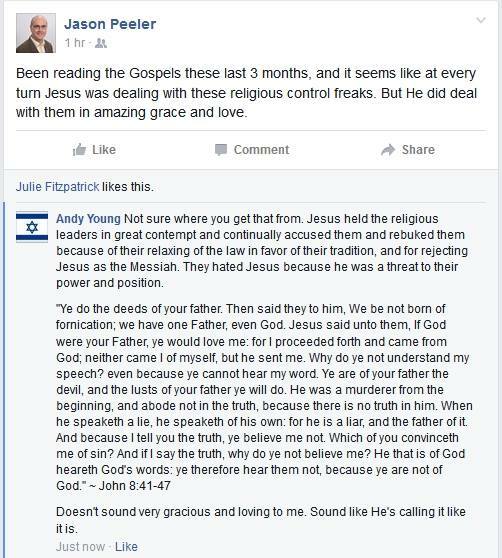 Wow the guy lays it on thick-godly is as godly does. The assumption is that the authority of the church is an extension of God’s authority or God’s proxy as it were. But no such authority was ever granted since Jesus said “all authority has been given to me,” and last time I checked Jesus never outsourced that authority. Intellectually they will never admit such things, but yet when you press them on it, they cannot help themselves. 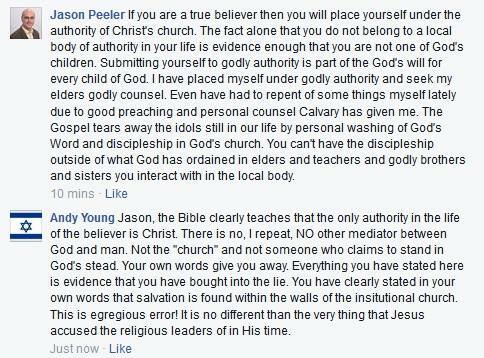 Putting yourself under the authority of the church only makes logical sense if one’s salvation is dependent upon it. And this guy says so in no uncertain terms. 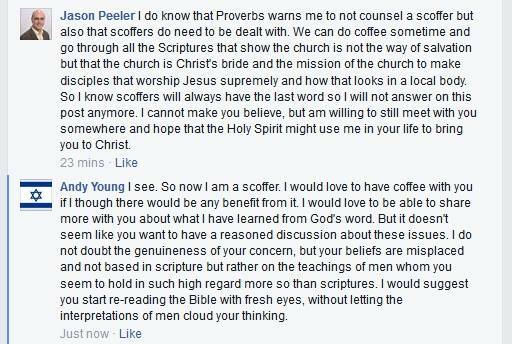 As you see, his language towards me changes as if he is speaking to one who is unsaved.